I have written about this before but I am still bewildered by what is so often taken for granted, good manners! Have a look around and you will see a mix of good and bad manners everywhere. There is one bad manner that really gets to me. When you open a door do you check to see who is behind you before you let go of the door and it closes behind you? A few days ago, I was in a lift (elevator for my American friends) with a gentleman (I use the term loosely). I followed him out of my hotel to the front door. He opened he door, walked through, then let go if it while I was still close behind him. He didn’t bother to check who was behind him and continued along his way. Now wouldn’t it have been a courtesy to the person behind him, yes that was me, to hold the door at least until I took hold of it. I also had luggage in tow so holding the door open would have been so polite and showed good manners. There are two types of people, those with good manners and those without good manners. Check to see if you and your team are the type of people with good manners. Are you holding doors open for your patients? So, what are your good manners when a patient arrives at your practice? Are you ready for your patient? Do you know their name, something about them and their appointment time and type? Is your patient lounge clean and tidy? Does your patient lounge smell nice? Do you stand up from your desk and walk up to your patients to greet them when they arrive for their appointment? Are you greeting your patients with a smile and holding the door open for them if they need a hand? Do you introduce yourself to a new patient and welcome back a loyal patient? Are you offering to take your patient’s coat, umbrella, shopping bags or anything else to make their appointment more comfortable? 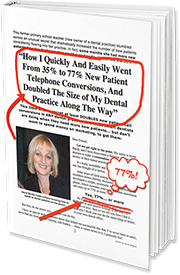 Are you offering to get your patients anything they need? It may be a refreshing drink or magazine to read. Do you let a New Patient know where the bathroom is? Are you interacting with your patients while they are in the patient lounge? Does the person who comes to get your patients for their appointment, introduce themselves to a new patient and welcome back a loyal patient. Having good manners with your patients will bring out the good manners in your patients. Good manners set you apart and good manners are memorable. Yes, I know people will remember both good and bad manners, but people are more likely to want to continue seeing and doing business with a person who has good manners. Wouldn’t you agree? Take time to look at how you treat your patients and I don’t just mean their dental treatment! If you are interested in my Call Tracking Service or have any questions please call 1300 387 044 or email jayne@thedpe.com. Stop missing out on making appointments. Canberra Master Class- Friday 3rd May 2019. Don’t miss this once in a life-time opportunity to see and hear Linda speak first hand. BOOK your tickets today and take advantage of the EARLY BIRD Offer!